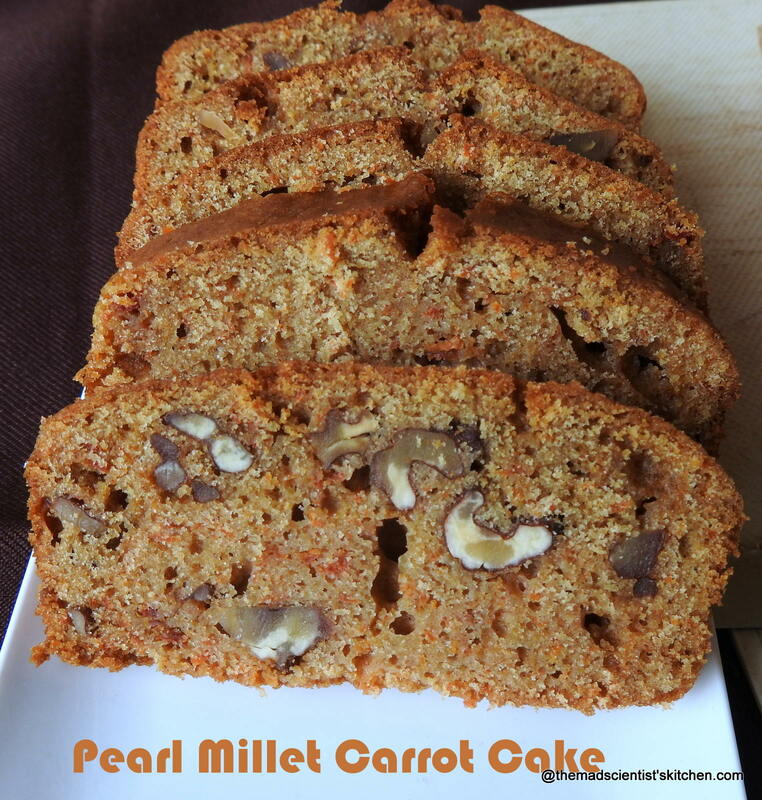 Bajra Carrot Cake also Pearl Millet Carrot Cake is a dessert that is healthy and full of fibre for a healthier lifestyle. Since this cake is simple and healthy it can be made by Bachelors, it can make a great option for breakfast or brunch, not just dessert. Make and share this cake for Easter which is being celebrated today! There are many types of millet available to us and used as foods by us humans. A good source of gluten-free nutrients, vitamins, minerals millet provides energy and can boost health. One of the millets is Pearl millet (Pennisetum glaucum) is known as bajra in India. The other names are Kambu in Tamil, Kambam in Malayalam, Bajri in Rajasthani, Gujarati and Marathi, Sajje/ kambu in Kannada, Bajra in Hindi, Urdu and Punjabi and sajjalu in Telugu. Pearl Millet can be used to make Khichidi, bhakri also known as roti. This is where the usage of pearl millet stopped for me. But with hubby having health issues we (read me) have taken a decision to include millets for a healthier lifestyle. Jagruti describing her mothers Rajasthani Bajra Raabdi just what we need for the summer that promises to be just HOT! Sharmila shares her Bajra Dosa that is so healthy and easily doable. Padmajha shares Sajja Boorelu a traditional rural sweet from Andhra Pradesh. Seema shares one ladoo, I dare not make for myself, not at this stage when I weigh more than hubby maybe when I am slim and trim as I was at 25 yes. Anyway jokes apart make Winter Perfect Bajra Laddo. Sasmita shares her delicious Veggie Pearl Millet Tart an idea that will be much appreciated by hubby. These are a few that I am sharing this post. Like I said I will be sharing more later in the month. Being diabetic does not mean that you have to stop enjoying food or sweets. Include them in your food but in moderation. I made this Bajra Carrot Cake and since hubby was to be admitted to hospital I put this cake in the fridge and forgot about it. Even the girls were not too interested in anything in the fridge so this cake lived in the fridge for about 6-7 days before I rescued it, clicked it and served it. It was a bit dry but then that must be because it was not covered in the fridge. The amount of sugar is okay if you are going to frost the cake since I did not frost it I thought a little more sugar about 1/4 cup more is acceptable. Also thought I have included the cinnamon powder and ginger in the recipe I have not used them. Pre-heat the oven to 150 °C. Grease a 6-inch baking tray with a little oil and line with a butter paper. Set aside. I used an 8 inch by a 3.5-inch tray. Sift together the bajra flour, wheat flour, cinnamon powder, baking powder and salt. Set aside. In a mixing bowl place the oil, add sugar a little at a time whisk. Add the eggs and whisk well. Fold carefully the sifted flour one teaspoon at a time, to the egg mixture the batter should be without any lumps. Add the milk to make a smooth batter not be too thick or too runny. Add the carrots, ginger and walnuts, and fold again. Bake in the oven at 150 degrees C for 20-25 minutes or until a skewer inserted into the centre comes out clean. Remove from the oven and let it cool for 10 minutes in the pan. Remove from the mould and cool before slicing. You can use butter in place of oil. 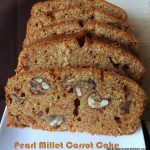 Bajra Carrot Cake also Pearl Millet Carrot Cake is a dessert that is healthy and full of fibre for a healthier lifestyle. Ultimate cake, wish i get few slices of this cake. Lovely bake Archana, cake came out extremely moist and super. The cake looks so delicious and spongy.. Must try this healthy cake. Thanks, PJ! Not include your post? Is it possible PJ? Hubby is back to his normal self, thanks. 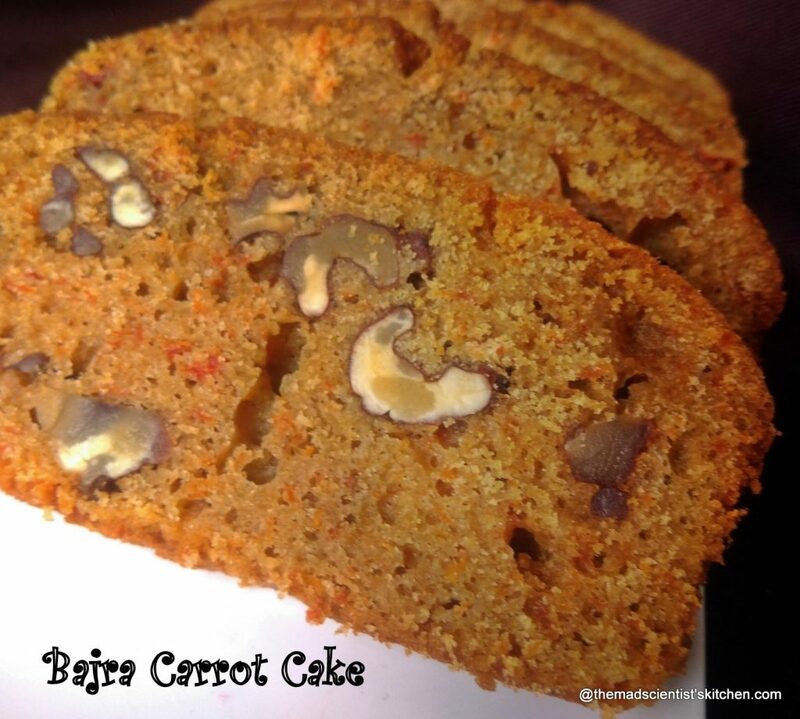 Bajra carrot cake sounds healthy and yummy. Your cake looks super tempting. Loved this flavourful cake. 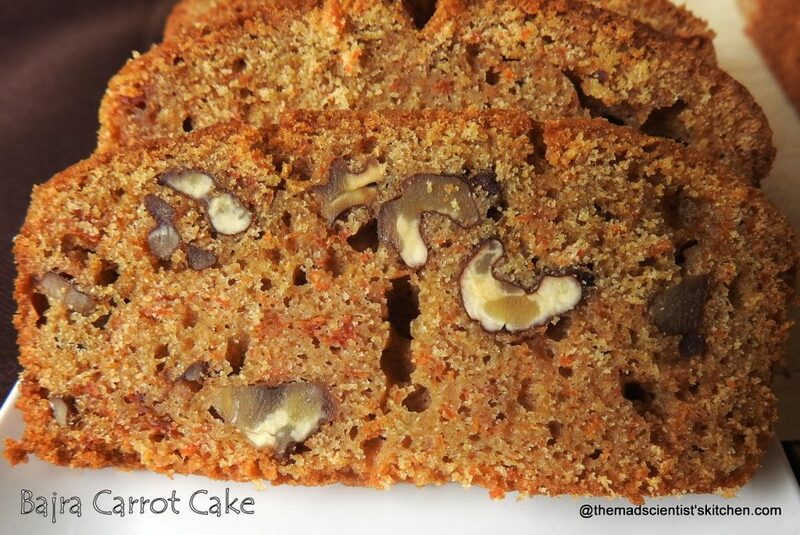 Such a yummy way to enjoy the healthy millets and carrots, bookmarking the recipe lovely share. Awesome cake using millet. Love the crumb and it looks very tempting. Have bookmarked the recipe. Hope your hubby is much better now. Thanks, Mayuri hubby is good now. As for the cake its delicious. So sweet of you to say I am inspiring you. Thanks. Rafeeda lol yes they are the walnuts are calling you to come and taste them. Actually, the cake was delicious and I generally served it warm with a dash of water sprinkled before MW. Wow! So innovative! Love the idea of using bajra & wheat flours in cake. Cake looks so delish. ???? Hope your husband is better now. I have never baked with bajra flour. This cook looks really look. He is good now Jyoti. Thanks. Hats off, girl! Your posts are always so creative and inspiring. You are both a scientist and an artist in the kitchen. ???? I love how amazing the cake texture turned out with bajra. A MUST try! Blush, blush, blush. ;D Thanks do try and share the results. perfect baked and such a guilt free cake ! Lovely share ! Wow what healthy and tasty bake. Cake looks so soft and moist.. I hope your husband is doing fine now. I am yet to bake with Bajra flour as I don’t bake very often. 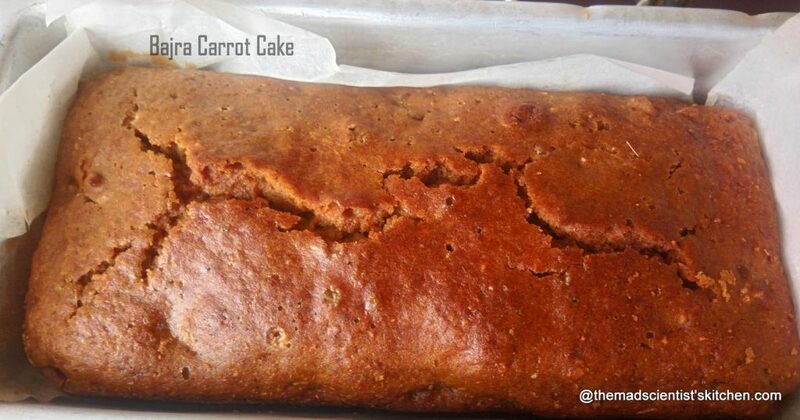 Your carrot bajra cake looks moist and fluffy. Looks so delicious too. He is good now Jagruti when he escapes my death grip :D! Thanks. Such a healthy cake it is. I have never made with bajra flour, do need to try sometime Archana. Lovely share. Thanks, Jayashree do share your pics when you make it. Such a healthy and nutritious cake and I love the use of bajra flour. I too try to sneak in bajra and rye flour in my bakes to get the family eats it. A bundle of healthy recipes with a wonderful Bajra recipe post.. Cake looks very soft and moist.. Including Bajra in diet like this would be so yum. I am going to bookmark this for later???? Thanks, Avin! Please share your pics.